Classical to Contemporary to design works of balance, proportion, beauty and function. Working together with our clients, we establish the unique style and specifics for each project. We then make detailed design & shop drawings for the project to be created. We work with sketches & drafting as well as Auto CAD, Auto CAD Inventor, Cabinet Vision, and other software applications as the project may require. Often we collaborate with Architects & Interior Designers and engineer their design concept drawings into working plans for the project at hand. 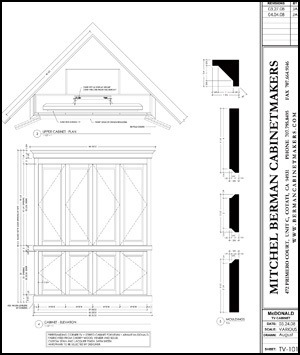 Mitchel Berman Cabinetmakers fabricates Custom Millwork and Cabinetry, built to suit our client's, exact specifications. We work for Architects, Interior Designers, Decorators and individuals who commission our services. 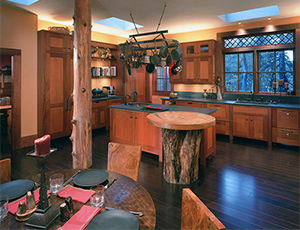 Fine Hardwoods and Exotic Veneers are selected with an eye to color, figure, and grain. The raw materials are carefully worked and transformed by our skilled craftsman into the custom Furniture, Cabinetry and Millwork that our client's have commissioned. 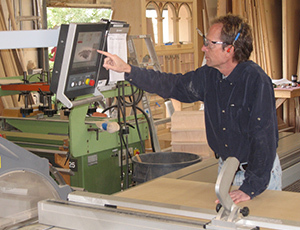 We also do custom Millwork and Woodworking on a fee basis. Processing customer's materials per specification. Wide Belt Sanding to 52"
Re-Saw Bandsaw Work to 18"